Simon Wickhamsmith is the recipient of a 2015 PEN/Heim Translation Fund Grant for his translation of The End of the Dark Era by prolific Mongolian poet Tseveendorjin Oidov. Read an excerpt of the translation here. What is modern? Mongolia seems to have an especially uneasy relationship with this question. The trappings of Western materialism do not necessarily signal the presence of modernism, and in Mongolia the very few truly modernist voices in the arts are equally at home with the intensely traditional nomadic culture, with the very real and ubiquitous contemporary presence of Chinggis Haan, with devoted practice of shamanism and Buddhism, and with the sense of the nation remaining a powerful force within Asia. Tseveendorjin Oidov stands alone in the Mongolian literary scene as a poet who has for more than 40 years pursued his own path, apparently disinterested in the fashions of politics or style, focused rather on his artistic vision. I met him in 2013, when I was researching a group of writers with which he had been active during the late 1970s. This group, called Gal (“Fire”), had as its primary aim the encouragement of its members to find their own artistic vision, an aim which perfectly suited Oidov’s particular and singular talents. I was immediately struck by the way in which, while acknowledging Mongolian traditional culture in his work—some of his poems have been written by channeling shamanic spirits—he makes art that draws on strands of European modernism and depends upon a determined and unwavering belief in his own vision. Many of these poems are accompanied by images, elegant line drawings reminiscent of Aubrey Beardsley or Picasso (whom Oidov refers to as one of his teachers). These works are a modern reworking of a traditional form called hos uyanga (paired lyricism, perhaps, or paired melody). Such reworkings of tradition, like his reworking of the psychotherapeutic and symbolic ideas of traditional modernism and of the imagistic exploration of the European literary avant-garde in the early twentieth century, characterize Oidov’s own creative development. At first sight, Oidov’s modernism lies in his imagery and formalism. He centers his poetry on the page as though to present his ideas as reflections of his own worldview. The images he uses,however, are as much reflections of French or Russian symbolism as they are of traditional Mongolian literature: lines of verse flow into the air as though painted by Chagall, and the enmeshment of innovation and tradition carries the reader into Oidov’s singular apprehension of love and longing, as well as the tensions through which his art has developed. Because of his apparent disinterest in popular acclaim, Oidov’s stature as a poet has been somewhat outshone by his visual art. His poetry has been only very infrequently published, whereas his graphic work is exhibited in galleries, and his design for the state seal is in constant view. His poetic work is by far the most adventurous to come out of Mongolia, and the foundation which it has prepared for future innovators promises well for Mongolian literature in the twenty-first century. Ts.Oidov (b. 1953) is a Mongolian poet, sculptor, and artist. During the 1970s, he was one of the founders of the Gal (Fire) group of writers and intellectuals, who sought to promote Mongolian traditional culture whilst retaining their individuality in the face of state censorship. Following the democratic revolution of 1989-90, he was asked to design the Mongolian State Seal, and is now widely respected as one of the country’s foremost artists. Simon Wickhamsmith is a scholar and translator of contemporary Mongolian literature. He teaches in the Writing and Asian Studies programs at Rutgers University. 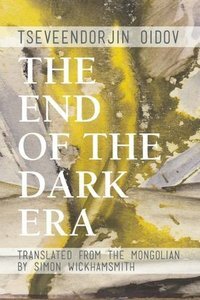 The End of the Dark Era will be published in the summer of 2016 by Phoneme Press/PEN Center USA.